Earlier this week, a new research report came out that discussed how small businesses are (or are not) using social media marketing to drive their business. I love this kind of stuff (10 years in the market research industry will do that.) But I also find it interesting that the article on eMarketer about the research asked aloud if small businesses were apathetic about social media simply because 47% of those surveyed said they did not use social media for business purposes and only 4% cited it as the marketing channel they could least do without. I’d respond with this: It’s pretty awesome that 53% of small businesses are using social media marketing. And unless you're a brand new business, I wouldn’t expect it to be the one channel you couldn’t live without. As a small business owner, you are an expert in what you do. And in most cases, that is not being a professional marketer and or a social media marketer. It’s our job here at Constant Contact to make it easy for you to use email marketing, event marketing, and social media marketing to help you be successful as a bakery, cleaning service, consultant, or restaurant. Not the other way around. 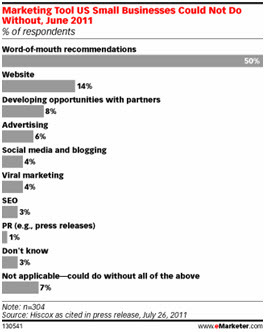 But the most exciting news to me in this research is that word of mouth recommendations are among the top “channels” that small businesses can’t live without. Of course, nothing does a better job of driving word of mouth than the combination of social media marketing and email marketing. For example, sending a well crafted email helps you get your message or promotion into your subscribers’ hands. Then, posting it to your Facebook Page or Twitter feed and asking your readers to share it gets your content beyond your own network and into the feed of your network's fans, friends, and followers, and gets the word of mouth engine going. Just within Facebook, it's also really easy to drive word of mouth in a number of ways beyond the news feed. In my opinion, the coolest new feature in Facebook for anyone with a physical location is the “Recommend This Place” box at the top right of your fans’ Facebook profile because if people love your service, you can ask them to recommend it and target the recommendation to specific groups within their network, or their entire set of friends. In the end, social media marketing is all about generating online word of mouth, and as networks evolve their tools this will become more and more obvious to everyone — whether you're a professional marketer or not. I, for one, love the opportunities for success that the combination of social media and email marketing presents to small businesses. They help you connect the need for word of mouth with the tools that make it happen. Want to learn more about social media marketing? Sign up for the Social Media Quickstarter! Ummmm, lovely article and I am amazed that relatively few small businesses use the social networks to help them. I cannot, however, find that new feature you are talking about "recommend this place" box. I don't see it anywhere. Is it only in it's beta form and visible only here and there for now?